iReboot, PowerManager, Restart, Lock, Shutdown, Repring….what is the difference? There have been quite a few apps released lately that Restart, Lock, Respring and Shutdown your iPhone. So, I thought I would run through some of the differences between them. It can get a little confusing so make sure you read carefully. 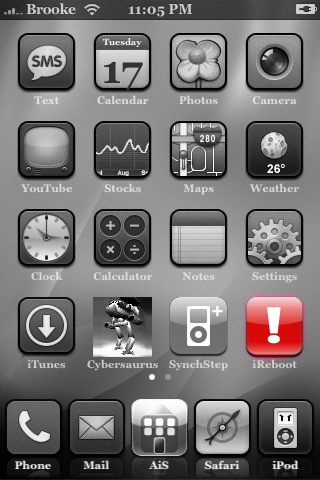 Restart/Killboard/Respring/Lock – These applications are one-touch solutions to restarting your SpringBoard. 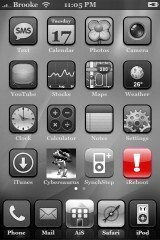 Just tap the application and they will restart your SpringBoard, bringing it to the lockscreen. 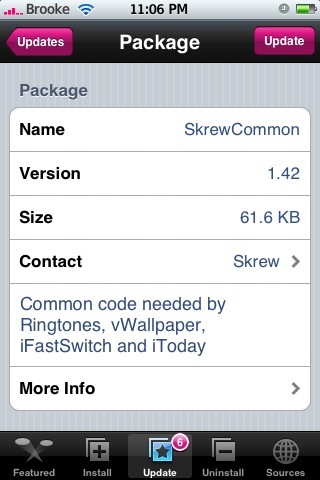 RespringBB – A one-touch solution to respring your SpringBoard without bringing it to the lock screen. Just tap the application and it will use the Set Language mode to respring your SpringBoard without going to the lock screen. 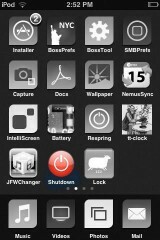 Shutdown – A one-touch solution to turning your iPhone completely off. Just tap the application and it will turn off your iPhone. This would be the same as holding down your power button. 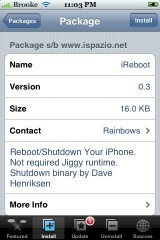 iReboot allows you to choose to Reboot your iPhone, Shutdown your iPhone or Restart your iPhone. It basically combines Restart, Shutdown and Lock into one application. When you open the application, you will get a main menu with the three options; Reboot iPhone, Shutdown iPhone and Restart SpringBoard. 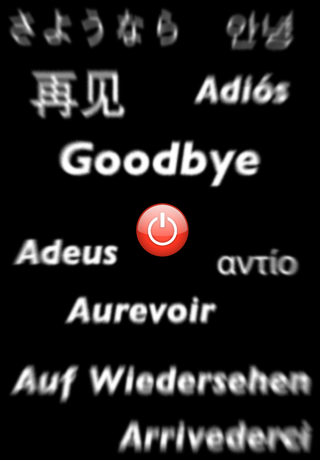 Reboot will turn your iPhone off and then back on, Shutdown will turn your iPhone off but will not turn it back on and Restart will restart your SpringBoard (bringing to to the lock screen). All three options work properly. 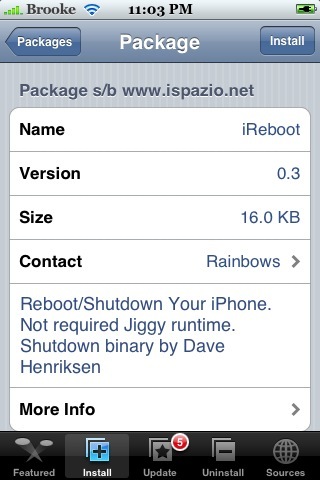 iReboot is avilable through the iSpazio source. 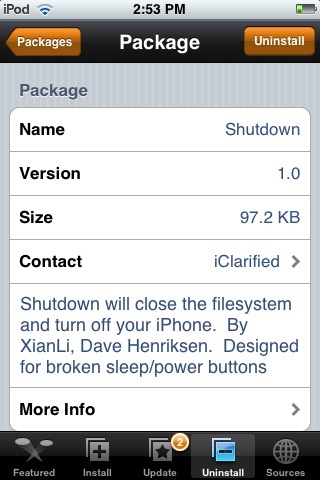 Shutdown was made by XianLi and Dave Henriksen. It was designed in order to allow people with broken sleep/power buttons to shut off their iPhone and iPod Touch. Once you tap on the application, a loading screen will appear and in under a second your device will be off. The loading screen graphic is very stylish. 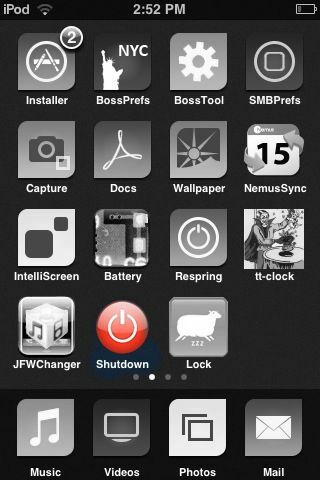 :) Shutdown is permanently staying on my iPod Touch, because using Shutdown to turn off your iPod Touch is a lot faster then doing it manually. 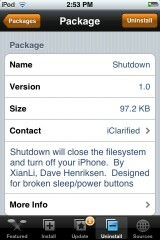 You can get Shutdown from the iClarified source. Check out the screen shot below! !